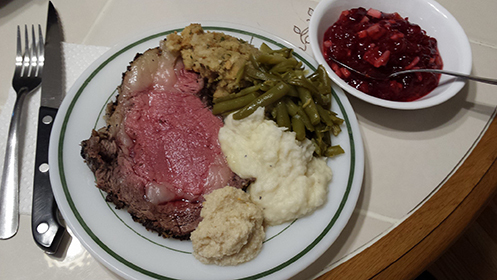 Place rib roast on a plate and allow to come to room temperature, approximately 4-4.5 hours. Combine butter, pepper, garlic, and Italian seasoning in a small bowl. Spread butter mixture evenly over entire roast (top, bottom, and both sides). Season roast generously with kosher salt. It shouldn’t have a salt crust, but it should have enough for flavour. (As a variation, you can slice your garlic cloves into thin slices and, using the sharp point of a knife, insert them randomly over your roast’s top side — then using the butter, pepper, and Italian seasoning (omitting the minced garlic) to coat the roast.) Place roast in a roasting pan and cover with the lid. Place the covered roasting pan in the preheated oven for 25 minutes. Turn the oven off. Leave the roast in the pan, in the oven with the door closed, let the roast sit in the oven for 2 hours. Remove roast from the oven, slice, and serve. To calculate the roast’s cooking time, multiply the exact weight of the roast by 5, and then round the resulting number to the nearest whole number. Roast the prime rib at 500 degrees F for that precise amount of time (i.e., 6.5 pounds would be 6.5×5=32.5, so you’d roast for 33 minutes). Remember to not open the oven door during the two hour cool down of the oven. In the event you have a convection oven that has a fan to automatically cool down the oven after you turn it off, you’ll either need to disable that function, or unplug your oven so that the cool down occurs naturally, unassisted by the fan. One further note: Because of the fat content of the roast, and the additional fat provided by the butter coating, it is very important to have proper ventilation in your kitchen. Otherwise, your smoke detectors WILL go off, and you may be visited by your local Fire Department.